The NRA has been trying to get yahoo states to put the dwindling pastime of hunting on equal footing with free speech and voting. Ten rural states–Alabama, Georgia, Louisiana, Minnesota, Montana, North Dakota, Oklahoma, Virginia and Wisconsin–have gone along with it before. Vermont did it in 1777, so don’t blame them. Until Arizona, it passed every time. This year NRA-lovers in 14 states tried to lard up their constitution with the right to hunt language, according to the National Conference of State Legislatures. Four got it on the ballot; it passed in the other three–Arkansas, South Carolina and Tennessee–but what do you want from the South? The measure in Arizona would have also given all power over hunting to the legislature. No more biologists! No more pesky environmentalists! And that basically would’ve meant: no more wolves. Arizona, New Mexico and the Fish and Wildlife Service have been tied in knots for decades over the reintroduction of the critically endangered Mexican gray wolf. The feds have effectively handed over control of the program to Arizona, which in turn defers to ranchers. 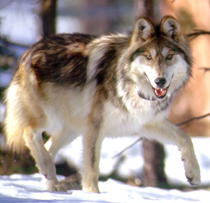 So, only one wolf has been released since 2006, even though the population is in sharp decline. Is it a victory to have Arizona still in the wolf management business? I’m not sure; if 109 had passed, it might have forced the feds to take charge. The counties where the last 40 or so Mexican gray wolves lives tended to vote for 109 and their God-given right to shoot things. The one clear victory for animals and animal lovers: Missouri decided it was sick of being the puppy mill state. Now breeders have a year to keep their stock of dogs below 50 adults and give all of them some minimum care, like adequate food and water, a yearly vet check, a little space. The American Kennel Club has long defended what it calls high volume breeders–and they had the support of Joe the Plumber, the LATimes reports. The measure passed with 55% of the vote. Want to Go to A Goofy Dog Event?